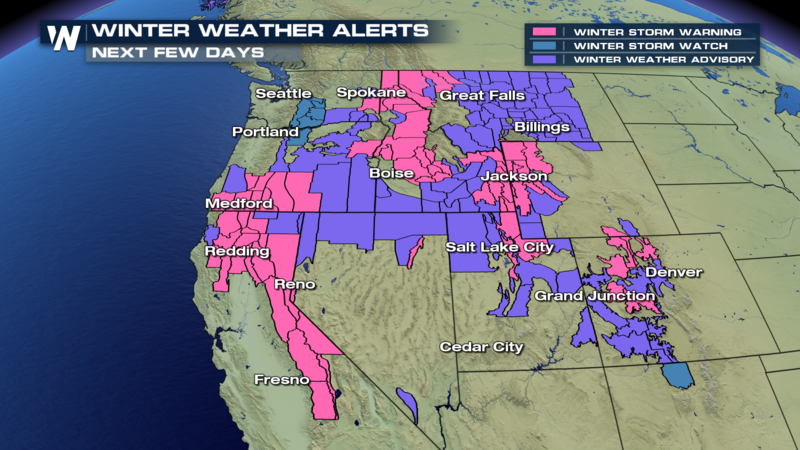 A series of storm systems will continue to impact portions of the West Coast through the week and into the weekend as waves of energy work their way into the region. 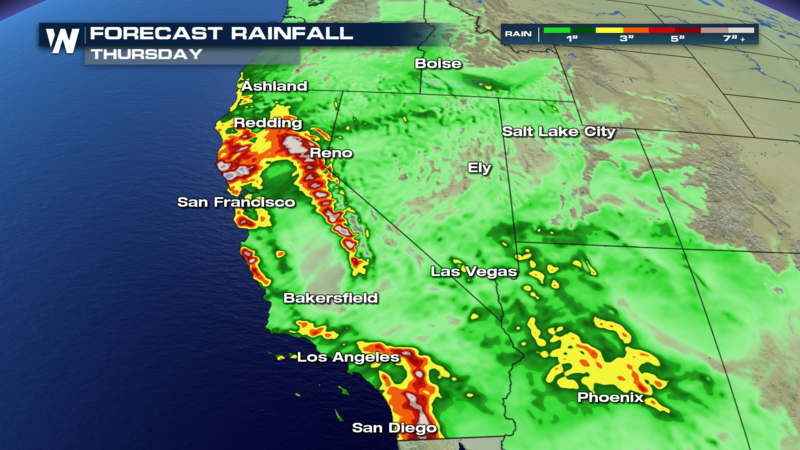 By early Wednesday morning, rain and snow are in the forecast for California, with numerous areas of Winter Weather Alerts for the higher elevations and Flood Alerts below 5,000′. This is the set up by 7 AM mountain standard time. 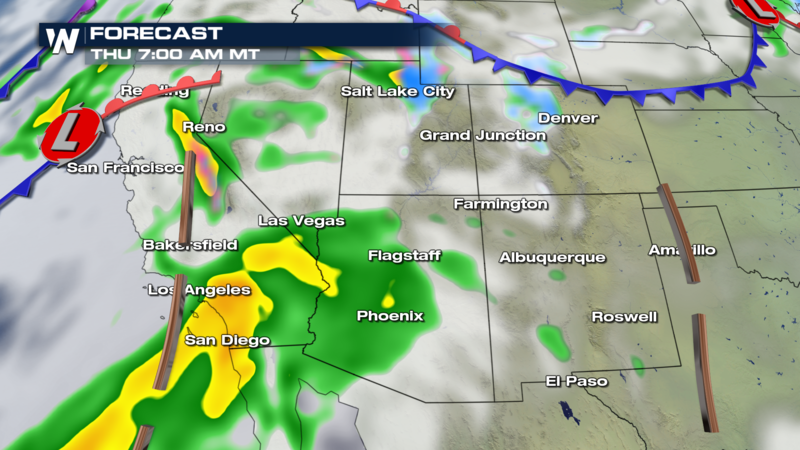 As we move forward into early Thursday morning, moderate to heavy rain is expected for areas in southern California as moisture works it’s way south. The pattern slowly starts to exit the region by late Thursday night into early Friday morning, as the main piece of energy moves east into the central Rockies, where moderate to heavy snow is expected to fall. 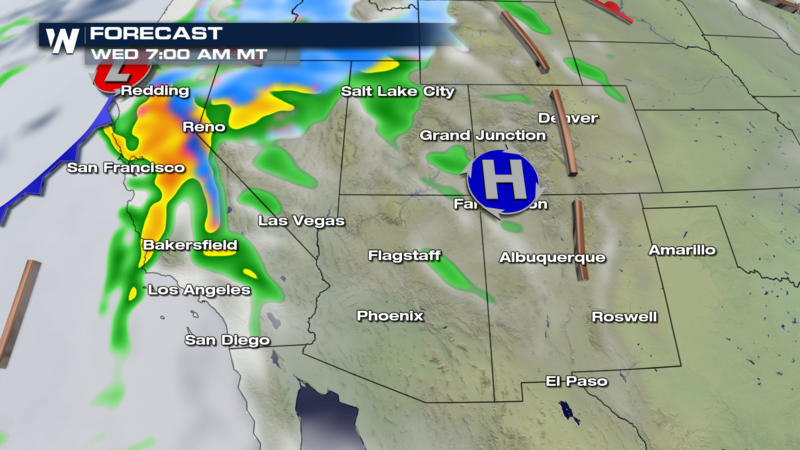 A few lingering rain/snow showers can’t be ruled out in California by this time-frame, but the bulk of the moisture will have moved east and into the inter-mountain west. Impressive rainfall amounts will have accumulated by late Thursday, with localized areas likely receiving over 6-7″. Seen from the map below, the darker shades of red –> to tan are the areas likely to see the heaviest amounts of rain. 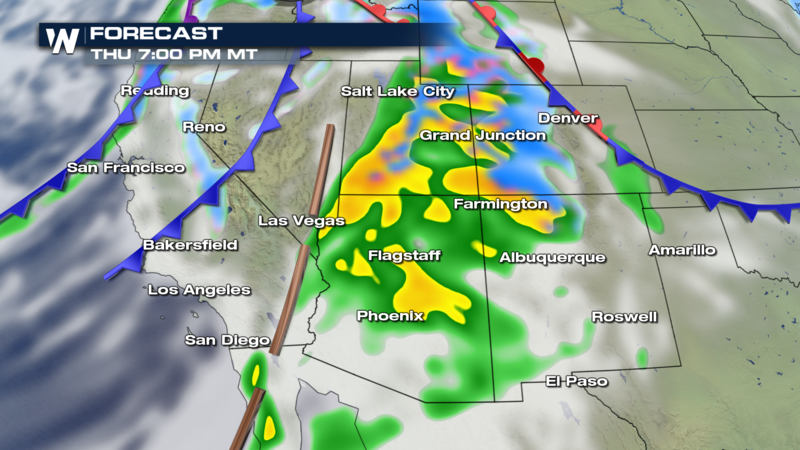 The moderate to heavy rain will transition to heavy snowfall for the higher elevations, most likely above 5,000′. 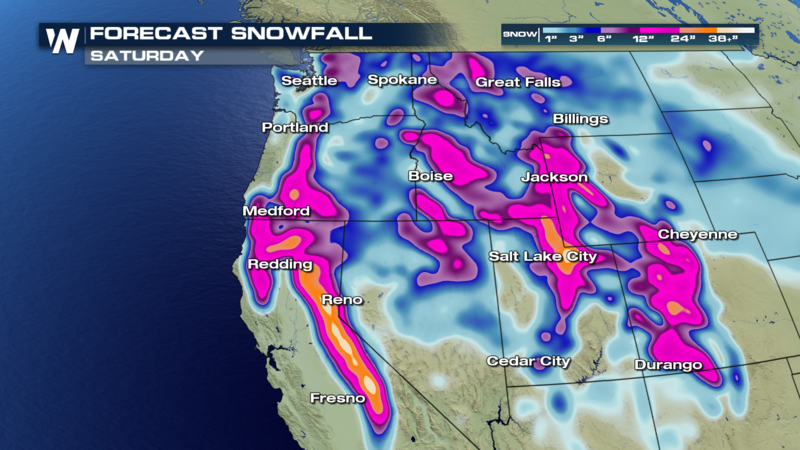 Totals through Saturday afternoon are shown below, with the Sierra’s likely receiving over 3′! Although the stormy pattern will deliver a powerful punch of the white stuff to the mountains, the lower elevations will be dealing with possible flooding through the week, especially below 5,000′. 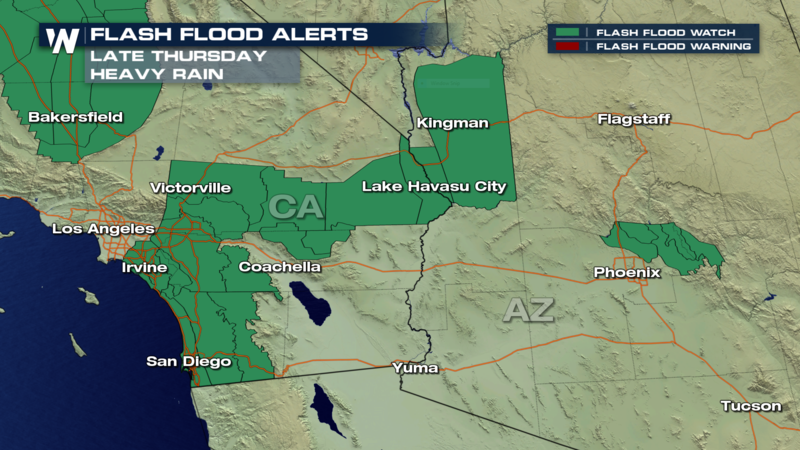 Flash Flood alerts for all the areas shaded in green will see the possibility of localized flooding. 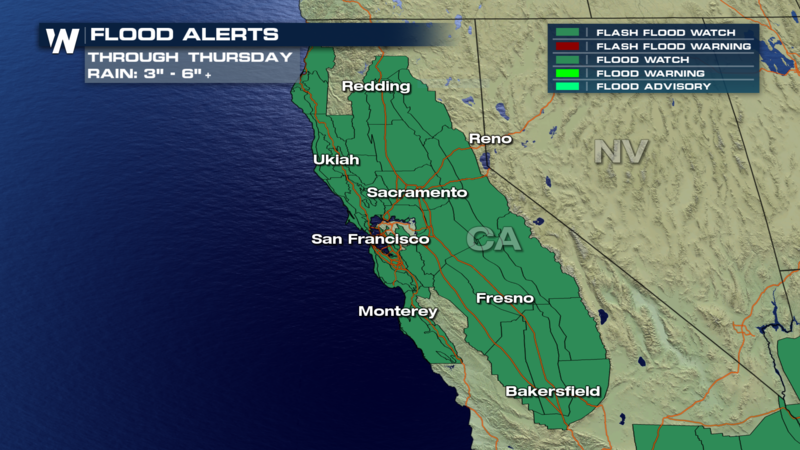 Remember, a Flash Flood Alert means that conditions will be favorable for flash flooding. Travel conditions may become hazardous rapidly, so always be sure to check out WeatherNation before heading out the door! For southern California, rainfall may exceed 1″ in areas of the valleys, while the higher elevations may see several inches by late Thursday night. 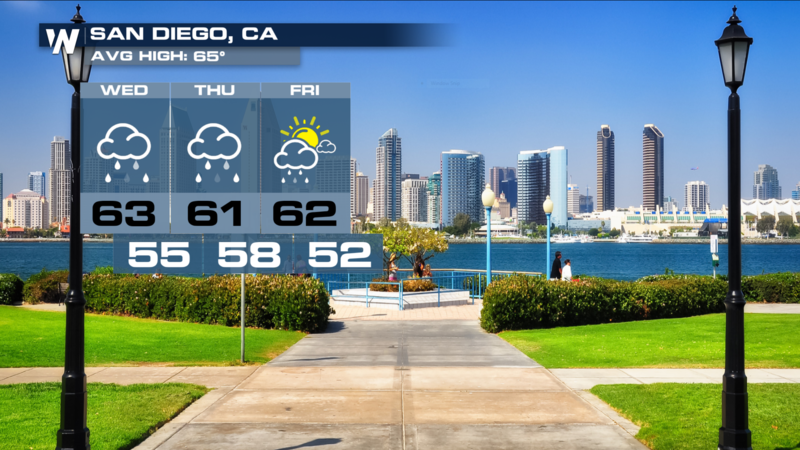 Here’s the extended forecast for San Diego, as showers and slightly cooler temperatures are in the forecast through Friday. For WeatherNation, I’m Meteorologist Greg Rule.